Has increased payout each quarter for the last four quarters. It won't require any convincing arguments for investors in Cogent Communications (NASDAQ:CCOI) to accept the new dividend payment the multinational Tier 1 ISP will pay for the second quarter of 2013. Today it announced a new distribution of $0.13 per share to be handed out on June 18 to shareholders of record as of May 31, representing an 8.3% increase from its first quarter payout of $0.12 per share paid on March 15. Cogent has raised its dividend every quarter since it began paying one in August 2012. The new payout annualizes to $0.52 per share and yields 1.8% at the closing price of Cogent Communications' stock on May 6. 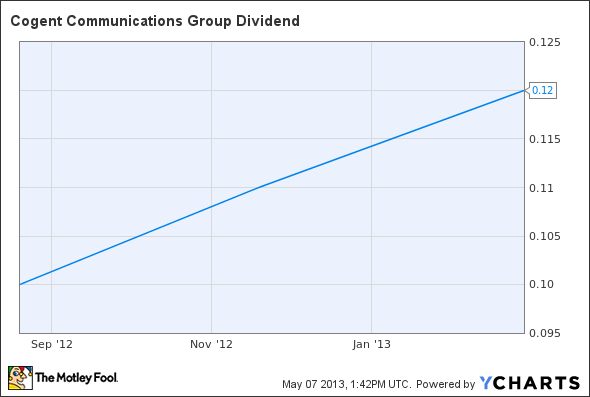 CCOI Dividend data by YCharts. Chart does not reflect new, higher dividend announcement.